I’m going to apologize up front for this, but this review is going to mainly be a large critique about the writing in this issue. If you wanna know my opinion on the art, go look at the other two reviews. Anyway. Writing- Honestly, I think this issue was the beginning of the end. Let’s go page by page. Page One/Two- Franklin is how old and is still saying Unca Johnny? Isn’t he like seven now? Unless he has some speech impediment that only affects the word Uncle, I have never heard someone around is age not saying Uncle. Then on the 2nd panel of page two, what is up with the ‘he lied’? Typo by the letterist, I guess. Page Three- Johnny is still Johnny. Okay. That’s a little better. Page Six- Johnny’s walking. See above. Page Seven- Doom speaking through Valeria. I honestly think this could have been a lot better executed. Doom speaking through Valeria is creepy, but what about a bodiless voice? That seems more like Doom’s style than speaking through a familiar. Page 10- On occasion, the FF can have their ‘duh!’ moments. In Part One, they were shown to have baby-sitters. I’m positive they probably have more than one, so why would you take the baby with you? Because Doom must kidnap the baby! They are asking for trouble. Page Eleven- This is going to cover the sending Franklin to Hell part. Sending someone to Hell does seem like something Doom would do to an adult, not to a little boy. Doom is constantly trying to prove that he is better than Richards and sending Franklin to Hell doesn’t seem like the Doom thing to do. Unless Doom was planning on rescuing him after the FF were in his nefarious clutches, but you know. But my name is not Victor von Doom, it’s Katelynn, so I don’t know what Doom would do. Page Thirteen- Taking out Stephen Strange. I can see it, because Strange would help the FF, but then there’s Triumph and Torment where they have a weird friendship going on. But I can see Doom doing this, so that’s a little better. 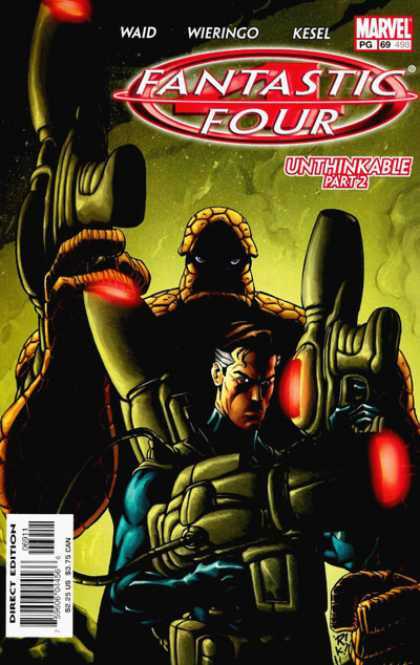 The Fantastic Four VS Doom- I’m just going to lump this all together. I hated, and I mean hated, this fight. For all the emphasis on his magical abilities from the previous issues, I was expecting him to be sitting on his throne with that infamous pimp goblet of is waiting for the FF with some magical symbol on the floor to trap them. I was so, so, so, disappointed with this fight. Though Doom’s barbs at Johnny had me giggling. As a weird finish, the ad for the Scooby-Doo cereal had me in stitches. I’m weird. I know.